Mosaic art involves creating images or patterns from pieces of glass, stone, porcelain, mirrors, tiles, or other materials. It is an ancient artform dating back thousands of years. Today, mosaic artists create colorful glass designs on all kinds of surfaces big and small. Although creating such complex pieces takes skill and years of practice, learning the basics is easy. Some of the earliest mosaics were constructed around 2600 BC in the temples of Mesopotamia in today's Iraq. In the early twentieth century, the remnants of a temple in Tell al-'Ubaid were discovered, containing mosaic columns adorned with mother-of-pearl, pink limestone, and black shale stretching over three meters tall. By the fourth century BC, mosaic art had spread throughout Mesopotamia, covering the floors of Hellenistic and Roman villas, with many examples now on display in the Bardo Museum in Tunisia. In 2014, the art form was propelled into the limelight upon the discovery of the largest-ever tomb in Greece, dating back to the times of Alexander the Great. Covering the floor of the structure, which may have been the resting place of royalty, is a pebble mosaic showing the abduction of Zeus' daughter, Persephone, by Hades, the underworld king. While mythological gods such as Apollo and Neptune were commonly depicted in mosaics of ancient Greece and Rome, the spread of Christianity led to a transition to biblical themes and symbols. In the cathedral complex of the Roman Empire city of Aquileia in modern-day Italy, mosaics include images of the Good Shepherd and the story of Jonah. On the other hand, Islamic mosaic art began to develop with more patterns and geometric themes and was carried over to the Iberian Peninsula by the Moors in the eighth century. Some of the most well-known examples today include wall art at Alhambra Palace and the Great Mosque at Cordoba in Spain. Throughout the middle ages mosaics continued to cover cathedral walls, such as at the Capella Palatina in Palermo and the Cathedral of Monreale. In Italy and Venice in particular, mosaics began to reflect Byzantine style through the twelfth and thirteenth centuries, later transitioning to the European fresco style. Over the last few centuries the craft has been embraced in Western culture not only to depict cultural icons, but also to adorn furniture and homes. Today, artists create flowers, animals, patterned backdrops, and other themes using mosaic techniques. 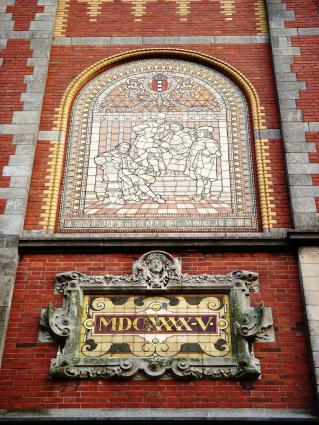 Today mosaics are displayed in traditional galleries and non-traditional venues around the world. In Chicago, Illinois, the Chicago Mosaic School hosts the Gallery of Contemporary Mosaics with work from world-renowned artists. The National Gallery of Art in Washington, DC, showcases mosaic art as part of an exhibit on Byzantine culture. Sicis, a mosaic company with boutiques around the world, hosts impressive collections, such as stunning wall mosaics made of 24-karat gold leaves. In New Orleans, Louisiana, True Mosaics Studio has been producing mosaic art for over 25 years, displayed not only at the studio, but also in hospitals, parks, and other public spaces worldwide. Perhaps the most well-known mosaics are not those tucked away within galleries, but rather those that seem to have taken on their own lives within communities. The New York City subway system is packed with mosaic art that's become all too familiar to daily commuters but remains eye-catching and alluring to tourists. Known only by the pseudonym "Invader," a French artist travels the world creating tile-based artwork inspired by video game characters and has even left his mark on the Hollywood sign in Los Angeles. In nearby San Diego, an affordable housing complex hosts a mosaic mural called "Neighbors Helping Neighbors" that measures over 40 feet tall. Deeply rooted in religion, mosaics can still be found in places of worship around the world, from the Blue Mosque in Afghanistan and the Hassan II Mosque in Morocco to the Basilica di Santa Maria del Fiore in Florence. It may look to the untrained eye as though such intricate mosaics are created by pressing small pieces of glass into a wet medium, such as plaster or cement, but that technique is rare. There are two major methods of creating mosaics in use today that involve creating a design piece by piece prior to setting with a wet substrate. You may be familiar with the installation of flooring tiles, with tiles being laid a grid pattern and secured to the floor with an adhesive, followed by the filling of the empty space with a sanded grout. The direct technique of creating mosaics follows this same concept. Artists use tiles, shells, class, stones, and other materials, referred to as tesserae, to create a pattern or image on a surface, such as a piece of wood, tabletop, or canvas. Pieces are individually laid and secured with an adhesive, such as glue. Once the glue has dried, grout can be used to fill in the gaps, with the extra being wiped away. Intricate designs often require the use of glass-cutting tools to shape each piece of glass perfectly to fit within a design, while patterns and abstract mosaics may allow for the use of pre-cut tiles or naturally shaped objects like stones and shells. Some artists using this technique even forego the grout, cutting each tiny piece of glass so exactly that they all fit in line perfectly together without gaps to create a larger image. In contrast, the indirect or reverse method of mosaic is used when the goal surface, such as the wall of a building, is not conducive for the individual placement of tesserae with adhesive. With this method, artists use a temporary medium and glue, such as paper and wallpaper glue, to create their design. Tesserae are secured upside-down to the temporary surface, which means the artist must work backwards from behind the design. The final image can then be transferred to its final location, where it is pressed into a medium such as concrete or onto an adhesive. Then, the temporary surface is removed from the front, and grout is applied as in the direct technique. While it will take some practice to perfect these techniques, creating basic mosaics is a fun and engaging hobby that just about anyone can pick up. The best way to familiarize yourself with the mosaic art form is to start with the basics. Select a flat canvas, such as a piece of wood or glass, along with your tesserae: tiles, flat stones, shells, glass pieces, etc. Create a pattern or design with the tesserae and use adhesive, such as Mosaic Mercantile Mosaic Tile Adhesive, to secure them into place. Leave gaps between the pieces, which you will fill with grout after you've finished your design and the adhesive has dried. It is best to choose sanded grout for any gaps in your piece larger than 1/8 inch as non-sanded grout tends to crumble easily after drying. Following the instructions specific to your grout of choice, apply the grout with your hands or a paint scraper, pressing it firmly into the gaps. Use a wet cloth to wipe away extra grout, but don't worry about leaving behind a thin layer on the surface of your piece. Once the grout has dried, you can more easily scrape the final remnants off without damaging your piece. Also consider using a grout sealer for a more long-lasting finish. Once you're comfortable with these basics, you can start experimenting with more complex projects. Try out different surfaces, like windows, pottery, or glass blocks (which make excellent holiday gifts when filled with a strand of colorful lights). You can also begin using patterns like these or even designing your own. To do so, you'll likely need to cut your own glass to create pieces that fit easily together to fill the spaces of the pattern. Colored pieces of glass can be purchased from many craft stores, and a mosaic glass cutter is an easy tool that can create smaller fragments to use in your pattern. Holding the glass face-down over a box or bowl securely in one hand, use the other hand to squeeze the spot on the glass you want to break. Be sure to use safety glasses and keep your face away from the glass as shards can result. For more precise cutting, consider using a glass cutter that actually scores the surface, allowing you to break the glass easily along a line. After cleaning the glass, use a ruler or other straight edge and score the glass with the tool, pressing firmly and evenly along the surface. The cutter applies oil to the surface as you work, easing the breaking process. After creating a score line, you can break the glass very carefully, either with your hands or a breaking tool. Mastering the art of cutting glass itself takes practice, but with patience it becomes easier over time. This skill will give you more flexibility in creating complex mosaics by allowing you to dictate the exact size and shape of your tesserae. Soon, you'll not only be cutting glass, but also creating your own unique patterns and making mosaic masterpieces: countertops, dynamic lighting, vases, murals, garden ornaments--the sky is the limit! Mosaic art can add vibrance and style to your own home and offer the perfect personalized gift for loved ones.